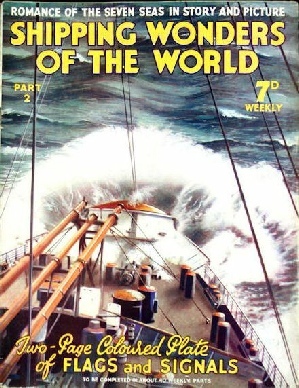 Part 2 of Shipping Wonders of the World was published on Thursday 6th February 1936. It was a standard issue of 32 pages. It included a superb centrefold colour plate illustrating flags and signals, forming part of the article on Signalling at Sea. There was no photogravure supplement. There were no editorial notes to accompany this week’s cover design. The story of Shackleton’s 1907-1909 remarkable expedition to the South Pole, written by Lt.-Com. R. T. Gould, and concluded from part 1. This is the first article in the series Epics of Exploration. A corridor between East and West, a vital link with the destiny of nations, and a short cut to India, the Suez Canal looms large in the story of the sea. This chapter is by Sidney Howard and is the first article in the series on World Waterways. This link is to a British Pathe newsreel made in 1920 on the Suez Canal, There is no sound to this clip. Two rival racing clippers that thrilled the world and brought fame to their masters on epoch-making voyages across the oceans. This article is by Frank Bowen and is the first article in the series Speed Under Sail. The development of marine communications from the makeshifts of the sixteenth century to the fine art of to-day, exemplified by the revised International Signal Code of 1934. The article is by F A Bex and includes a two-page colour plate which is illustrated below. There is a complementary article on Flags and Ensigns in part 54. When the architect of a vessel has finished his preliminary work the construction begins, entailing skill and labour that may endure from six months to six years. The article is by the consulting editor A C Hardy. THE train ferry must carry railway carriages, freight cars and sometimes locomotives on her main deck. In addition, sleeping and dining accommodation for passengers and, in many modem ships, a garage are essential. Since much of the heavy cargo is on deck, the hull - as will be seen - is a broad, shallow one, and there is ample space below the deck for machinery. To prevent any twisting due to corner loading, the hull must be stiffened with strong fore-and-aft girders. A different type of train ferry is illustrated in part 22. This is the first article in a long-running series illustrating various Merchant Ship Types. Weary toil and frustrated hopes were the lot of the indomitable men who salvaged the gold and silver from the Egypt, which for eight years lay undisturbed more than seventy fathoms below the surface of the sea. The article was written by David Masters and is the first in the series on Dramas of Salvage. The article concludes in part 3.